For the past four years, I have led workshops that teach kids about electronics in afterschool programs, libraries and in formal classrooms. All of these environments allow kids to create with electronics. My students make their own light-up greeting cards, wearable electronics, and electronic games. Through these projects kids learn the physics of electrical circuits plus how to build them. Electronics projects can be done at a low cost – My budget for materials as an educator has always been very limited. I could never afford to buy expensive robotics kits or electronic learning toys for all my students. By combining electronics components with basic school supplies like pipe cleaners and construction paper, I have been able to offer creative electronics projects to my students. I have learned where to find low-cost materials and also find replacements to expensive parts required in some projects. It’s very satisfying to be able to do these projects with large groups of kids. Educators often think that teaching electronics is very expensive but in reality it can be affordable if you know where to buy your supplies. Materials management is key to a successful experience – In my workshops, each student gets their own set of materials. It’s very important to me that each child is be able to take home the projects they make so they can share with their family.The hardest part about this is making sure I have all the materials and electronic components. I order electronics online from several suppliers and have been frustrated when not everything comes in on time despite planning ahead. I’m excited to announce our new educator program – a community for educators interested in bringing STEAM to classrooms, libraries and other learning environments. 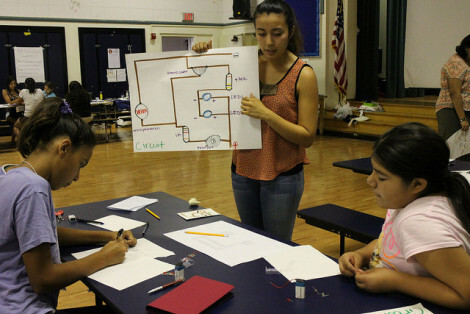 KitHub creative electronics projects are specifically designed to scale from one kid to 100 kids. The hands-on activities have been tested in school classrooms, makerspaces, after-school clubs and in home-school settings. You can join a community of innovative educators who are forging new pathways for kids to learn about electronics in a fun and safe environment. All the mothers that attended the robotics night engaged in a different relationship with their daughters that night. It was so wonderful to experience the collaboration and the energy that filled the room. It was a creative, engaging, team building experience like no other! My daughters and I loved it! Who qualifies as a KitHub educator? A KitHub educator is someone that regularly teaches groups of children in schools or other informal learning environments.